My wife and I are pretty avid watchers of the show New Girl. Ok, by that, I mean, she has seen all of them and I have seen some of them. It’s impossible for me to get anything done, or pay attention to anything for that matter, while the TV is on in my general vicinity, I’m way too distractible. Anyway, in one of the episodes, Schmidt drops some coffee grinder truth in perfect, pretentious fashion. Have a look. “It’s a top-of-the-line-“ conical burr grinder. Do you know what that means? It means it doesn’t smash up the beans like some pedestrian blade grinder - it actually grinds them for a deeper, richer, and more satisfying flavor profile!” I couldn’t have said it better myself Schmidt. Let’s break that down a little and chat about the reasons you should consider a burr grinder over a blade grinder. Let’s start by defining the differences between the two types of grinders. As the name implies, blade grinders use a propeller-like spinning blade to chop up the beans into smaller pieces. Typically, the blade continues spinning and chopping until the all the beans are chopped up. Burr grinders, on the other hand, consist of two revolving abrasive surfaces that grind the coffee between them a few beans at a time. Within the burr grinder type, we have two different styles: conical and flat. The cone shaped conical burrs feed beans through the top and expel the grounds out the bottom. The flat burrs use high RPM motors to expel the grounds out the sides. Here’s where we start splitting hairs when we talk about quality differences. In short, flat burrs produce more consistent grinds at the expense of greater heat build up. The conical burrs, on the other hand, typically cost less and greatly reduce the amount of ground waste build up. Mostly thanks to cost, I’ve only owned conical burr grinders. Based on my research, the differences between the two styles only begin to make a difference to a coffee shop and the barista dialing in the espresso. 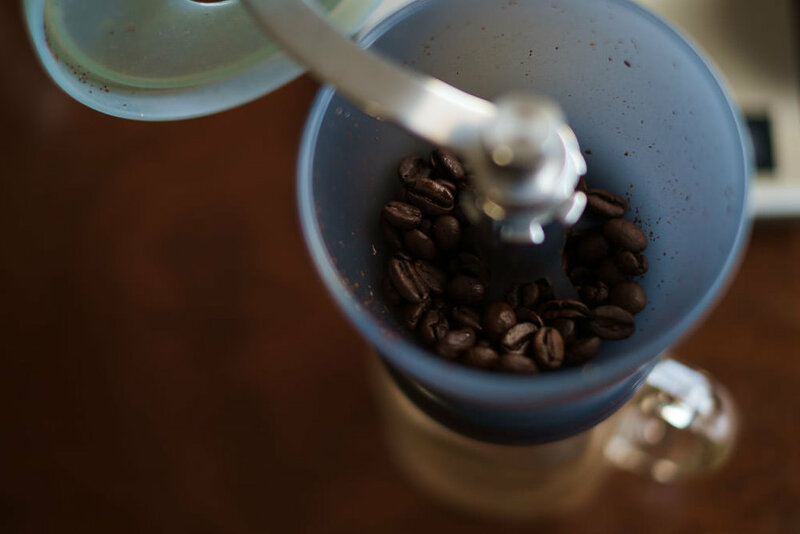 For the time being, we’re going to stick to the conical style and move on to why you should look into a burr grinder. Ask any coffee professional and they will tell you the grinder is the most important piece of coffee equipment they own. That’s because of the importance of grind consistency in the brewing process. As the water comes into contact with the grounds, the greater the amount of surface area, the faster the solvents extract. If the size of the ground particles varies wildly, so does the extract. Tiny particles will extract beyond their ideal range and begin contributing bitter and dry compounds before the larger particles even have a chance to begin extracting. The “pedestrian blade grinder,” as Schmidt so pretentiously calls it, chops at the beans indiscriminately and continually pulverizing pieces into increasingly smaller pieces. This creates an impossible to control situation. No matter how accurately you pulse the blades, you will end up with significantly varying grind sizes. Burr grinders, on the other hand, only allow each bean to pass through the burrs once. This process reduces the bean to uniform particle sizes ideal for controlling extraction. By adjusting the distance between the two burrs, you can control the size of the grind. Burr grinders provide the consistency and precision to the most important step of the brewing process that blade grinders lack. Freshly roasted coffee beans have a delicate sensitivity to heat. As the particles heat up, the solvents begin to break down and hopefully dissolve in the surrounding water. Reducing a bean to grounds requires force and often friction. If the grounds get too hot during the grinding process, the solvent will break down before they ever come in contact with water. As the particles sit in the grinder basin, the continual friction from the spinning blades inevitably causes some heat building. Thanks to the slower grind speed and the single contact with each bean, burr grinders can limit the amount of heat build up. So, What Grinder Should I Buy? The answer to this questions hinges greatly on how much you are willing to spend. By default, burr grinders cost more than blade grinders. You can easily spend anywhere from $60-$2300 for an electric burr grinder of varying quality. The Skerton was my first burr grinder. I still have it and I still use it every once in a while. Affordability and consistency make this an easy first step for most into the burr grinder game. As a plus, the threads of the glass catcher come with are also the same as a standard mason jar. So if you happen to break yours like I did, it's an easy replacement. If you want to splurge a bit, you could go jump up the Skerton Pro, which adds an easier adjustment nut. The Handground is my new go-to, favorite grinder. I use it on a daily basis. I love the design, it's simple to use grind adjustments and consistency. It does take some getting used to, the lid locks opposite to what feels natural. Thankfully, this company is rad and if you break something like I did (notice a pattern here? ), you can buy each of the individual pieces separately. That means you don't have to buy a whole new grinder just because you got a little excited and knocked it off the counter. This is the electric grinder I personally own. It's one of the few sub-$100 electric grinders with a real steel conical burr system and also features as borosilicate glass catcher that's supposed to keep static down. So far this grinder has treated me well. The grind is a little less consistent than both the Hario and Handground but not having to grind by hand is pretty nice sometimes. Personally, I wish I would have ponied up a little extra for the Encore. This is the grinder I wish I would have purchased. Baratza holds a high reputation in the coffee industry for their high quality, long lasting products. The Encore also has steel conical burrs, 40 adjustment steps, and produces more consistent grinds than the Bodum. For those looking to making espresso at home or just wanting to step the grinder game up even further, check out the Virtuoso. Considered one of the best entry-level espresso grinders, this grinder can also take care of everything down to French Press. It touts upgraded burrs, steadier burr mounts, stronger motors and even finer adjustments. Whew. That was a lot. Hopefully I didn’t lose you along the way. If you just scrolled down to this point, here’s the TL:DR. Buy a burr grinder, not a blade grinder. As always, if you have any questions, comments, or thoughts for future content, drop them in the comments or shoot me an email! Shop Amazon, Support the Blog! The links in this post take you straight to Amazon, don't cost you any extra, and gives me a little commission when you purchase. Win win!